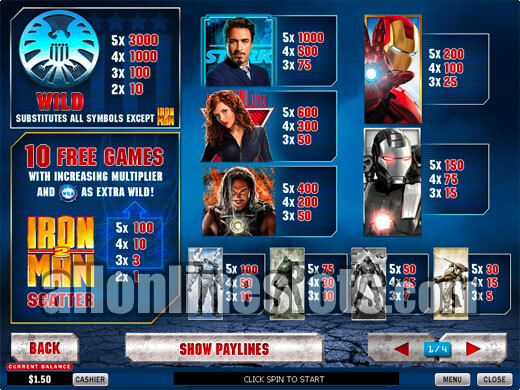 Iron Man 2 follows on from the success of the first Iron Man slot from Playtech. The game is based on the Hollywood sequel and features characters from the film including Ivan Vanko, Natasha Romanoff and of course Tony Stark / Iron Man. 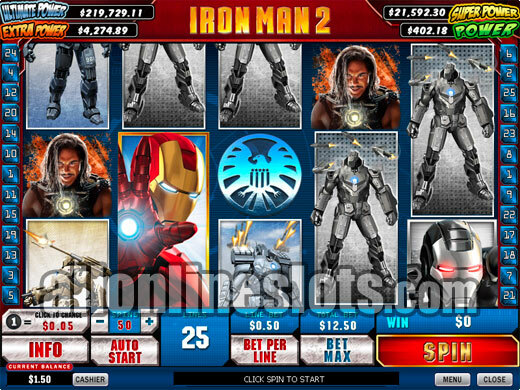 Iron Man 2 is the sequel to the very popular Iron Man slot from Playtech. 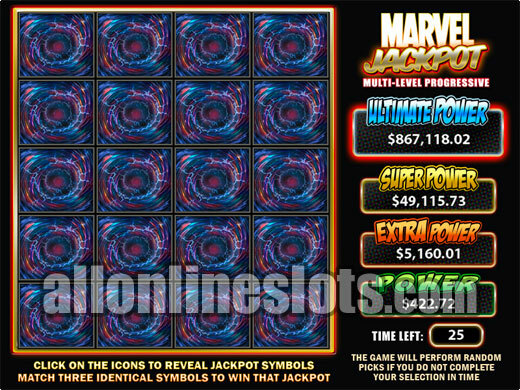 Like the original the gam is part of the Marvel Jackpots link which means you have the chance to win one of four progressive jackpots on every spin. The game has a free spin feature with increasing multipliers and a fixed wild symbol. The game is based on the Hollywood film released in 2010 with all of the symbols on the reels coming from the movie. This includes Tony Stark (Robert Downey Jr.), Ivan Vanko (Mickey Rourke) and Natasha Romanoff (Scarlett Johansson). It's not the first time that Playtech has released a film based slot with others including Gladiator, Kong and Rocky. The game uses the 5 reel, 25 line format with a max bet of 10 coins per pay line. This makes for a 25 coin max bet and you can select from a big range of coin sizes starting at 0.01 and going up to 1.00. While there is no specific bet need to win the progressives the higher you bet the bigger the chance you have of triggered the jackpot bonus. On the reels you have the Eagle Symbol which is wild and substitutes for everything but the scattered Iron Man 2 logo. As usual five wild symbols award the top pay which in this case is 3,000 coins or 30,000 coins at max bet. The next highest single line wins are for the five Tony Stark symbols (1,000 coins) then the five Natasha Romanoff symbols (600 coins) and then five Ivan Vanko symbols (400 coins). After these pays you have six different double height symbols that make up the rest of the line wins. These double height symbols occupy to symbol positions which mean you can get the same win on multiple lines if you get several of the same symbols. The pays for these symbols come in at between 200 and 30 coins for five of a kinds. The Iron Man 2 logos are your ticket to the free games. 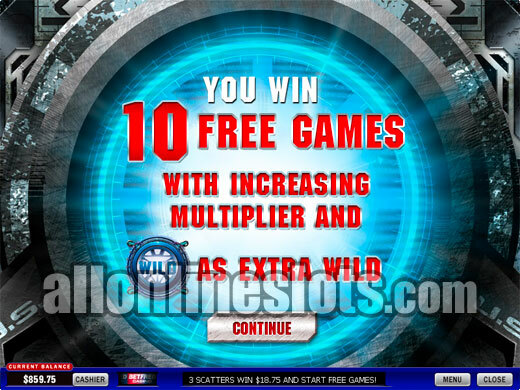 Get three or more and you win 10 free games with increasing multipliers and a fixed wild symbol. For all of the free games a wild is added to the middle position of reel three. This makes getting those crucial five of a kind wins even easier during the free games. To add to the excitement the free spins have increasing multipliers. Every two spins the multiplier increases by one. This means that on the final two spins you have a X6 multiplier which boosts the top pay to a very nice 180,000 coins. The only negative with this feature is that the free games cannot be re-triggered. 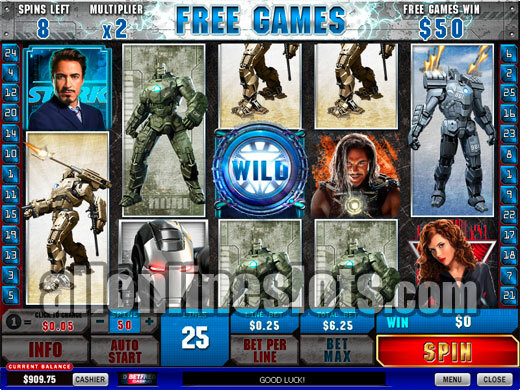 Iron Man 2 also has four random progressive jackpots that can be won at any time. When the Mystery Jackpot feature is triggered you move to the bonus stage where you have a 4x5 grid. You get to pick segments until you match three symbols and win the corresponding jackpot. Getting to the jackpot bonus guarantees that you will win one of the jackpots. Iron Man 2 stands out for several reasons. First it really captures the theme of the movie well. Second there are some nice pays on the base game as well as even bigger wins on the free spins. Lastly you have the chance of winning a progressive on every spin which keeps things exciting. Overall, a top rated online slot.